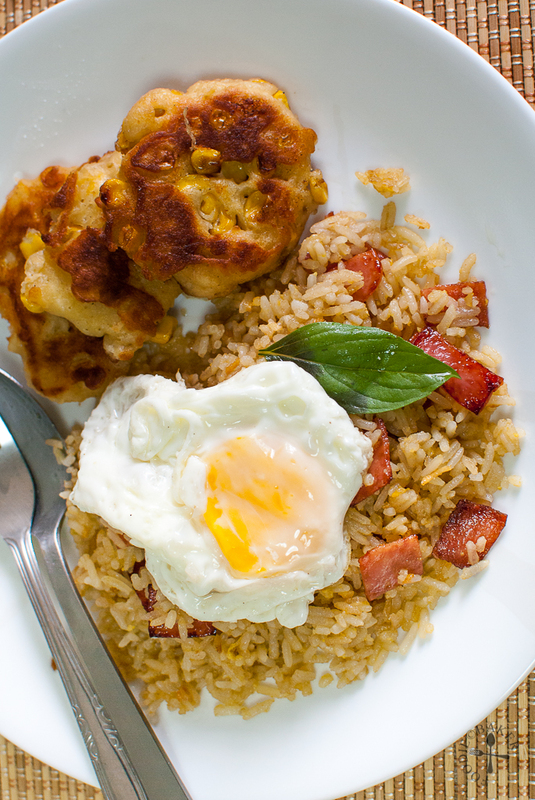 Fried rice with sunny-side egg and corn fritters! After 5 mediocre/semi-failed/failed attempts in making pandan chiffon cakes, I’ve decided enough is enough! I managed to get well-risen cakes, but the flavour is just lacking – I can’t seem to extract out a rich pandan flavour from the leaves, all I get is an overwhelming coconut taste… so until the next pandan cake challenge, I doubt I will be trying it again any time soon, haha! So, in an attempt to finish up the remaining coconut milk and pandan leaves, I decided to make something savoury – coconut-pandan rice. It is a very simple dish, just replace the water used in the cooking of the rice with coconut milk! As the cooked rice didn’t look photogenic at all, I decided to fry it with garlic, ham, a little egg, soy sauce, fish sauce and Thai basil (grown by my mom, thanks mom!) to give it some colour and a lot more flavour. It was pretty delicious and I felt a lot better after all the pandan cake failures. 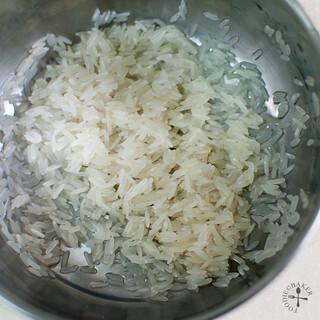 1) Rinse the rice and drain. 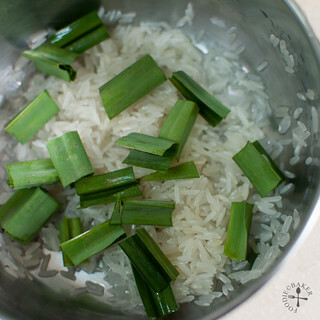 2) Add in pandan leaves. 3) Followed by coconut milk. 4) Cook and let the rice cool. 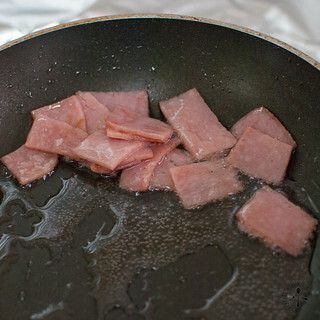 5) Fry some ham until warmed through. 6) Then sizzle some garlic until nice and golden. 7) Dump in the rice and fry away! 8) Add in the seasonings. And that’s all! Time to dig in! 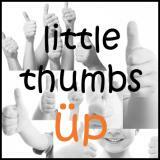 I’m going to submit this to Little Thumbs Up organised by Zoe from Bake for Happy Kids and Mui Mui from My Little Favourites DIY. This month’s theme – Pandan – is hosted by Joceline from Butter . Flour & Me. All pandan recipes submitted by other fellow foodies are all linked at this post, do check them out! Rice: Rinse the rice and drain. 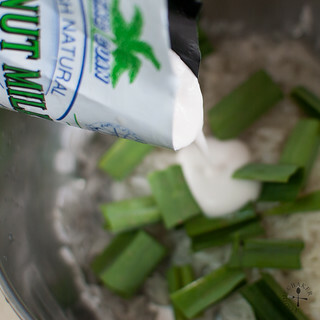 Add in coconut milk (amount according to packet instructions) and drop in the pandan leaves. Cook rice according to packet instructions and let cool completely. Cover and refrigerate overnight to dry the rice a little. Let the rice come to room temperature and separate them into grains using a spoon. Remove and discard the pandan leaves. Set aside. 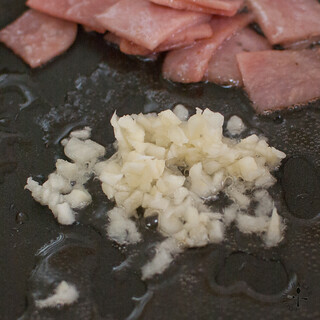 Fry: Beat the egg in a small bowl, then whisk in the salt, soy sauce and fish sauce until incorporated. Set aside. Heat a frying pan over medium heat and add in ½ tablespoon oil. Add in the ham / chicken and cook through to warm it up. Push the ham / chicken to one side then add in the remaining oil. Add in the garlic - it should sizzle gently - and cook until lightly golden. Immediately add in the rice and turn up the heat to high and stir-fry until all the rice have been coated with oil and heated through. 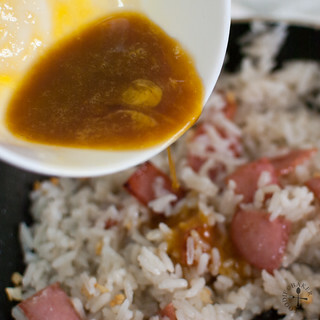 Add in the egg-soy sauce mixture and keep tossing until the mixture has been fully absorbed. Remove from heat and stir in the Thai basil leaves. Serve immediately - I love it with a sunny-side egg! I am not going to include the amount of coconut milk used as I have always estimated the amount of liquid used. If unsure, simply follow the instructions stated in the packet. 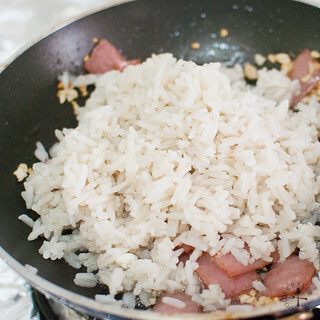 Overnight rice is always the best to use for frying as the grains are drier so it won’t get mushy as easily. 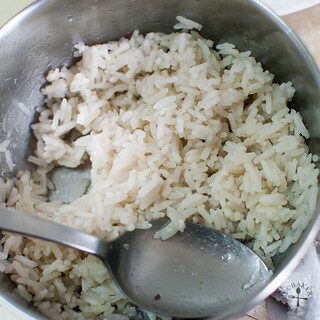 If you are cooking the rice to be used on the same day, reduce the amount of liquid by just a bit so the grains are drier. You can use all kinds of aromatics and ingredients – I’m using the simplest and always available garlic in my pantry as well as ham because that’s what I have on hand, but I wouldn’t mind throwing in some minced ginger or spring onions for additional flavour. Cooked shredded chicken can be a substitute for ham too. Thai basil leaves are purely optional but I love the unique taste of it, go light on the basil as it’s pretty strong and add them only at the end. 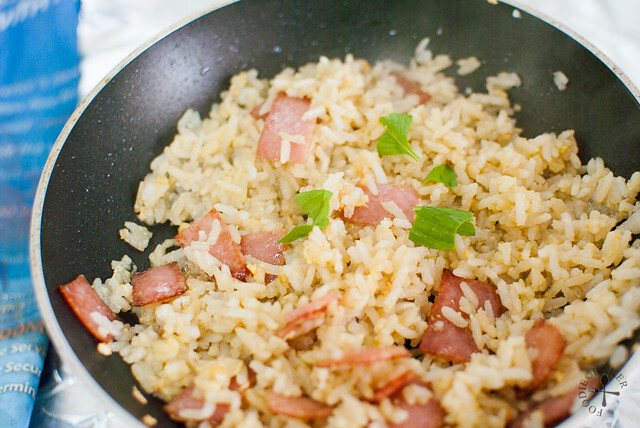 Your fried rice looks very inviting. I love the taste of coconut. Yum! Yeah, there are some pandan leaves which lack in flavour. But nevertheless, I am so loving this fried rice and yes to that egg on top! Hi Jasline, your fried rice look so inviting and scrumptious. Thanks for sharing your recipe. Have a nice week ahead,regards. 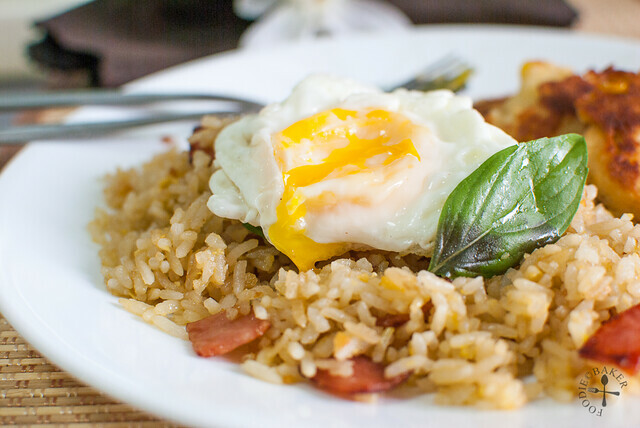 Your pandan fried rice looks yummy and yes for the fried egg over the top! Some pandan leaves are lacking in flavour, while some are extremely fragrant, choose the dark green ones. And a little pandan essense added in is OK too, for me! Haha! Needless to say your fried rice must be very aromatic and delicious. Hi..thanks for finding me and now I’m following you. Your fried rice looks yummy and with all the pandan leaves, I’m sure it smells good. What a delicious looking rice dish! Hi Jasline , love fried fice and this looks so yummy , I bookmark it and thanks for dropping by my blog and thanks for sharing this greatdish :).